In 2009, I had an opportunity for a big Canada trip, starting in Saskatchewan and traveling east, stopping in Montreal for the Worldcon where I picked up my Golden Duck award for Lighter Than Air. After that, we kept going east, up the St. Lawrence, until we turned north through Quebec and took the lightly traveled route into Labrador. A lot of this trip was taken on faith — that there really would be a place to get gas, because the map sure didn’t show any towns, and we were still in the region where people didn’t speak English. It was a lovely trip, mostly on gravel roads, where the tundra landscape only rarely hinted at human presence. Then, half-way across Labrador, we stopped at Churchill Falls, a company town dedicated to keeping the massive hydroelectric power plant running. I was captivated by the culture and the life these people lived in this isolated location. I knew I’d have to write a story set in this place. I even had my hook. These people didn’t have to pay for electricity — what was the point? So what could a person do in this far north location if he had unlimited electricity? I also wanted this to be a road trip story, so that I could include some of what I had just seen in my trip. I even started it in Crescent City, California, where a metal cylinder falls out of the sky, showing a GPS bearing off to the north-east. I also wanted to include Twitter. When I travel across the country, I tweet interesting events — my character would do the same. So my guy Seth and his big sister Biz travel northeast, with not a clue as to what they might find, but he has his buddies with him in his pocket. This book was short, as far as word-count, so I felt permitted to experiment with the format. The messages between friends were formatted like a twitter app. Images and links were real. I set up real twitter accounts for each of the characters and tweeted the text that showed up in the novel. The ebook version even has live links. I also included a image banner at the beginning of each chapter. Some illustrate things in the book. Some are scenes I took on my trip that Seth would have seen too. 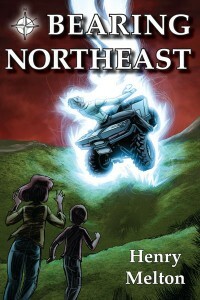 So in spite of the fact that this book never took off and has sold poorly, Bearing Northeast is my favorite.